They say a picture is worth a thousand words. This photograph, taken this morning on my regular ride to work, won’t be winning any Pulitzer prizes but it does have a lot to say about the state of cycling in London in 2012. 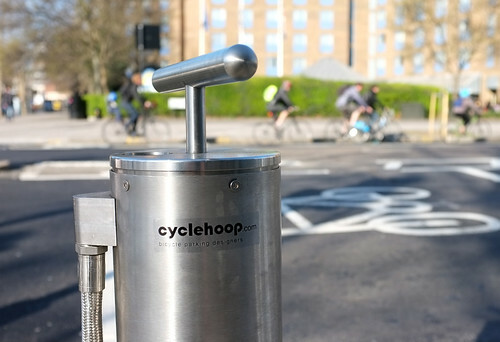 In the foreground you can see a row of newly installed stainless steel bike parking stands, made by Cyclehoop, a company founded by the talented architect and product designer Anthony Lau and one of a growing number of small, hip London-based start-ups who are playing their part in current bike boom. At the far end is a shiny new Lezyne track pump encased in a towering column of brushed steel. It is free to use for anyone whose tyres need a top up. 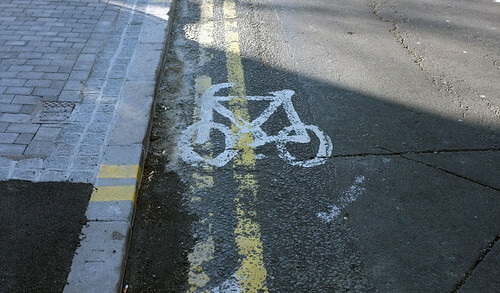 Of course, cycling in London is très fashionable and everyone wants their bit of the bike boom. The Times is campaigning for cycling and politicians are falling over themselves to get with the cyclists. They’ve given us subsidised hire bikes and even as they struggle with bruising cuts to public expenditure they are renewing perfectly serviceable Sheffield stands and throwing in top-of-the-range track pumps for good measure. 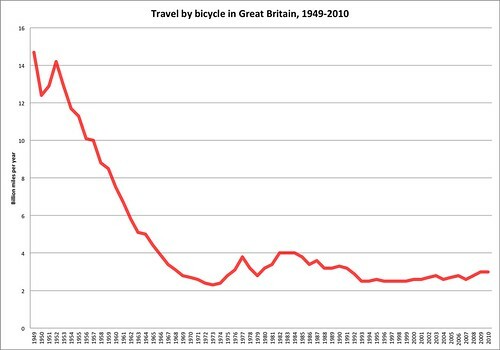 None of this goodwill goes as far as challenging the primacy of the motor car on the public highway, reducing speeds or re-allocating even a modest amount of road space so that people aged eight to eighty can ride their bikes in safety and comfort. But it’s the little things that count and a stainless steel track pump really shows us that they care, doesn’t it? To the right of the track pump is a bicycle locked up to the new stands. 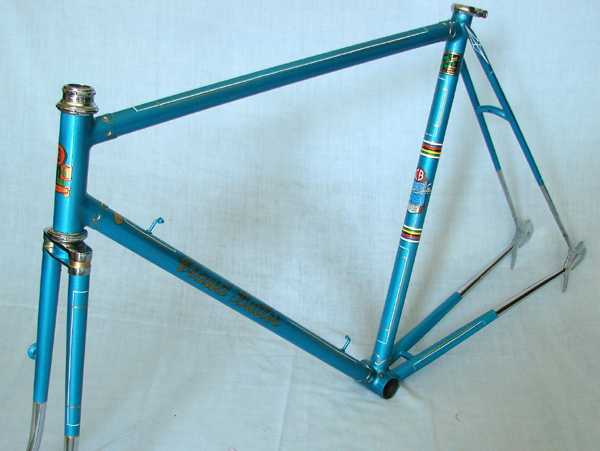 It’s low end road frame with skinny tyres, deep section rims, mountain bike handlebars. No chain case, no mudguards, no pannier rack and no basket. The chain is poorly maintained and orange with rust. In other words, it is the typical bike offered to the prospective London commuter cyclist by the major London bike shop chains. Look more closely and you’ll see it’s a Claud Butler ‘Criterium’, a 2011 model (now discontinued) whose recommended retail price was £299. It is still available online for less than £250. Claud Butler was a framebuilder from Clapham, just down the road from here, and one of the giants of British bicycle history. In the days when every London neighbourhood had its own frame builder, Claud Butler’s lightweight racing machines stood above the rest and helped define a golden era of mass cycling in Britain that began in the 1930s, blossomed in the years following the Second World War and lasted until the Great Extinction of the late 1950s when mass car ownership began to consign the bicycle to a marginal, mostly recreational role. The 1950s Sport Anglais model, pictured below, shows the very finest of the Claud Butler marque. The elaborate bi-laminated lugwork, the partly chromed biplane fork crown and detailed box lining are the height of skilled craftsmanship. In those days a Claud Butler bicycle would cost a full month’s wages, maybe two. And many Claud Butlers from this era (and later) are still ridden today. Our sub-£250 ‘Criterium’ model makes more modest demands on the cyclists’ wallet for it is a standardised, mass-produced product of the global economy and not build to last. Who knows where it was made, by whom, in what conditions. 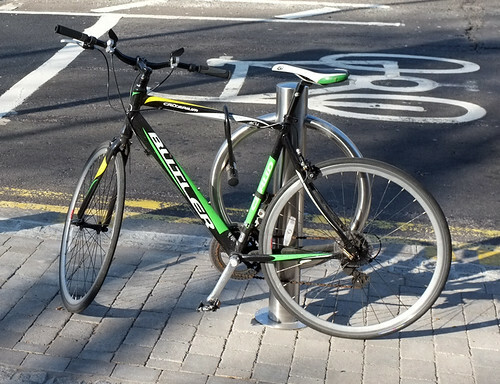 I draw a little comfort from the thought that somewhere in a far off eastern land, someone cared enough to ensure that the fork, frame and saddle each boast the distinctive ‘lemon and lime’ colourway that any Claud Butler connoisseur will immediately recognise as the distinguishing feature of the 2011 ‘Criterium’. If he weren’t spinning in his grave, I am sure that Claud Butler, as a former racing man, would share my own doubts about the suitability of the ‘Criterium’ model that bears his name for anyone taking part in an actual Criterium race, such as the London Nocturne, which returns to Smithfield Market this summer, sponsored by IG Group, ‘a world leader in the trading of financial derivatives’. Even the financial whizz kids of the City want their share of the cycling pie. But I digress. Back to our street scene. The two cyclists we see are wearing yellow high visibility tabards, standard issue kit for the London commuting cyclist whose major concern is getting home without bodily injury. Not that wearing such a garment will ensure against a lorry crushing you to death under its wheels (click here to read the Coroner’s report following the inquest into the death of London cyclist Emma Foa). The cyclist waiting at the red light is unusual and I don’t mean because it’s unusual to see a London cyclist waiting at a red light. How so, you might ask. 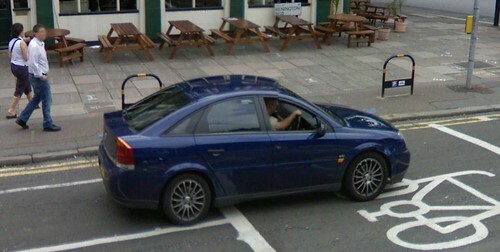 Is this not the archetypal London cyclist? It’s true, he’s one of several hundred thousand people who have made use of the London Cycle Hire scheme (aka Boris Bikes) and, like many other London commuting cyclists, he’s sporting a helmet and a casually cycle-specific outfit comprising of a pair of baggy black shorts and the aforementioned high visibility tabard. But it is the combination of these two choices that makes our man a most unusual sight. Overwhelmingly, people riding Boris Bikes wear neither helmets nor high viz and find their normal clothes more than up to the task. Most often they ride in a smart suit and tie, sometimes in a long, flowing flowery dress and occasionally a pair of velvet loon pants. In short, people on Boris Bikes wear their everyday wardrobe, whatever that may be. While their contribution to London’s overall transportation mix has been minimal, the 8,000 subsidised Boris Bikes have done more to promote the possibility of everyday cycling in everyday clothes than any amount of cycle chic blogging, tweedy runs or state-sponsored bicycle catwalk shows. Boris Johnson, our dishevelled, tousle-haired cycling Mayor is as good sartorial ambassador for everyday cycling as you could expect to meet. Unfortunately, he is also the person with the most real power to improve London’s roads for cyclists yet he thinks that it’s fine to cycle down the Euston Underpass or around the Elephant and Castle roundabout, as long as you keep your wits about you and he thinks that the best way to make London a world class cycling city is to splash a lot of blue paint around. Returning to the photograph, you’ll notice that unlike both of the cyclists, the large black minivan has no high visibility overgarments or markings. An observant reader tells me that this is one of the new style London taxis made by Mercedes Benz. Its driver clearly doesn’t care much about his own safety on the road, preferring jet black for a sleek, stealthy, Knight Rider look. Nor does he care much about the safety of others, including our pair of safety-conscious cyclists. Not only content with occupying the 5 metre long cyclists’ Advance Stop Zone he has encroached a further metre over the stop line towards the pedestrian crossing. There is a large police station very close by to where this photograph was taken, but the taxi driver need not concern himself as according to this London barrister the police have a ‘total tolerance’ policy in relation to this kind of traffic law violation, as most drivers know. 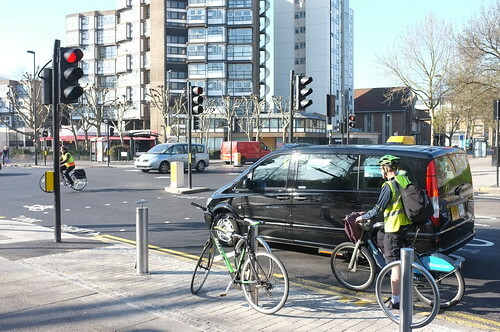 Thanks to the taxi driver’s casual indifference to the rules of the road, the Boris Biker is perfectly placed in the vehicle’s blindspot, ready to to be tipped off his bike should the taxi turn left when the traffic light turns green. Let’s hope it is on its way west towards Kennington and not south towards the Elephant and Castle gyratory system towards which the cyclist in the middle of the crossing may well be heading. You may want to wish her luck for at the Elephant and Castle she will find herself in no doubt that whatever the politicians say about a cycling revolution, no matter how many stainless steel track pumps appear like futuristic mushrooms on London street corners, we are still deep in the period of the Great Extinction of cycling. And there is a long way still to go. This entry was posted in Advocacy, Articles by Jack Thurston. Bookmark the permalink.